Few names in fashion resonate with as much admiration and clout as the famous Saint Laurent. The label’s founding designer created some of fashion’s most revolutionary styles (the women’s tuxedo, for one.) Today, the new Saint Laurent designer Anthony Vaccarello is creating the dresses, jackets, tops, and pants women dream of owning. A wardrobe filled with Saint Laurent means never having to wonder what to wear to your next event. A flowing Saint Laurent dress is perfect for almost any occasion, from casual outings to dressier receptions. For cocktail parties and evenings out, reach for a sculpted mini or a top rich with interesting details. 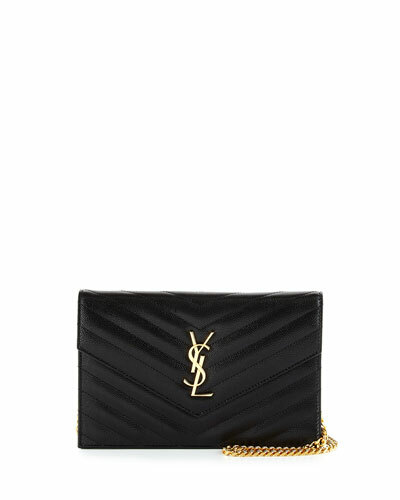 Your go-to accessory, a clutch bearing the Saint Laurent logo, is instantly coveted. Every season, fashion editors look to Saint Laurent for the next big things in apparel, shoes, handbags and beauty. We invite you to explore these innovative collections at Neiman Marcus now. Fendi wallet crossbody bag with stud trim. Removable chain shoulder strap. Flap top with cutout logo; magnetic closure. Center zip divides interior; leather lining. One bill and six card slots. 5.3"H x 8.9"W x 1.6"D. Made in Italy. Les Petits Joueurs goat leather crossbody bag with beaded palm tree features. Flat padded top handle, 4" drop. Removable, adjustable shoulder strap, 17.5" drop. Envelope flap top with magnetic closure. Divided interior; center zip pocket. 7.9"H x 10.6"W x 4"D. "Pixie" is made in Italy. Les Petits Joueurs leather crossbody bag with metal piping. Flat top handle, 5" drop. Removable rainbow shoulder strap, 17.7" drop. Les Petits Joueurs leather crossbody bag with metal piping. Flat top handle, 5" drop. Removable rainbow shoulder strap, 17.7" drop. Flap top with magnetic closure. Exterior, suede colorblock accordion sides. Center zip divides interior; leather lining. 7.9"H x 10.6"W x 4"D. "Pixie" is made in Italy.